Ralph Millward Big Issue Seller. On 7 May 2009, Ralph Millward, Big Issue seller outside Marks & Spencer in Seamoor Road, Westbourne, was senselessly killed by three teenage boys. The 41 year old was found under an upturned trolley near his pitch. The three teenagers were convicted of his manslaughter by Winchester Crown Court just over a year later. The trial revealed that the youths had been drinking cider at a friend’s flat nearby in Westbourne. They apparently went to the victim, looking for tobacco. When he refused their request, he was subjected to a vicious attack. Two of the youths later returned with the trolley, and continued the attack. Ralph Millward was left for dead, with serious injuries. The battered body of the Big Issue seller was discovered by street workers a few hours later. The jury were unable to agree a charge of murder, but found them guilty of the lesser charge of manslaughter. He had been selling the Big Issue at the location for 9 years, and was a very popular local character. He had a reputation for always being in a good mood, and was known for being an avid reader. Several hundred people attended a memorial service for him, which started at his pitch, and then made its way to the Baptist Church. The Rev Chris Brockway called Ralph “a man who touched the hearts of many in our local community”, adding: “In spite of his battles and struggles with life, he was always concerned about how you were.” The many tributes paid paint a picture of person who touched many hearts, and put others before himself. This just makes his killing even more senseless. 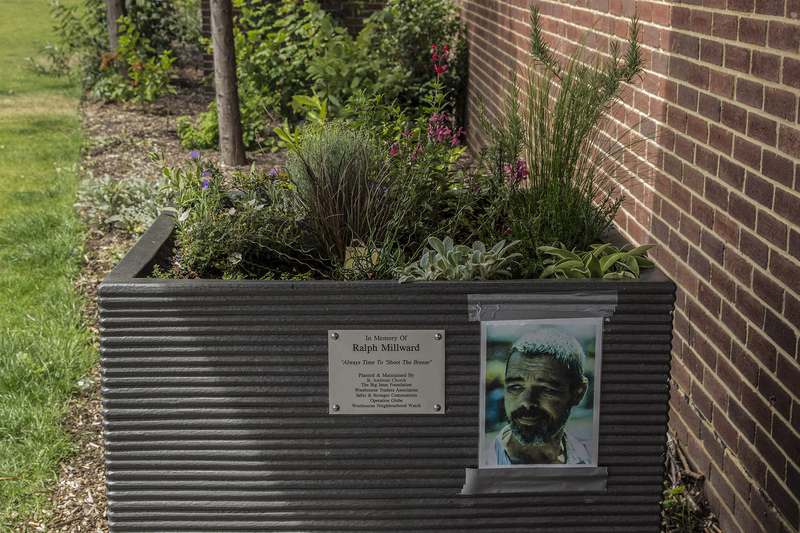 A memorial dedicated to Ralph Millward, Big Issue seller was set up on his pitch, and is maintained by the community. The Rev Chris Colledge, current chair of Bournemouth in Bloom, has just planted this out as a sensory garden. It is right that his memory should continue to live on in the spot where he will always be remembered.